Most of qualified teacher who are looking for a job in South Africa now are able to register with the South African Council for Educators (SACE). It’s impossible to be employed as a teacher without registration in the council. To complete the application process prepare SACE application form and pay a required fee (R60.00 for South African educators and R120.00 for foreign educators). Note, that your qualification must be recognized for employment in education before you check in SACE. In case, you have foreign qualifications, apply to the South African Qualifications Authority (SAQA) or the National Department of Higher Education and Training (DHET) for evaluation. 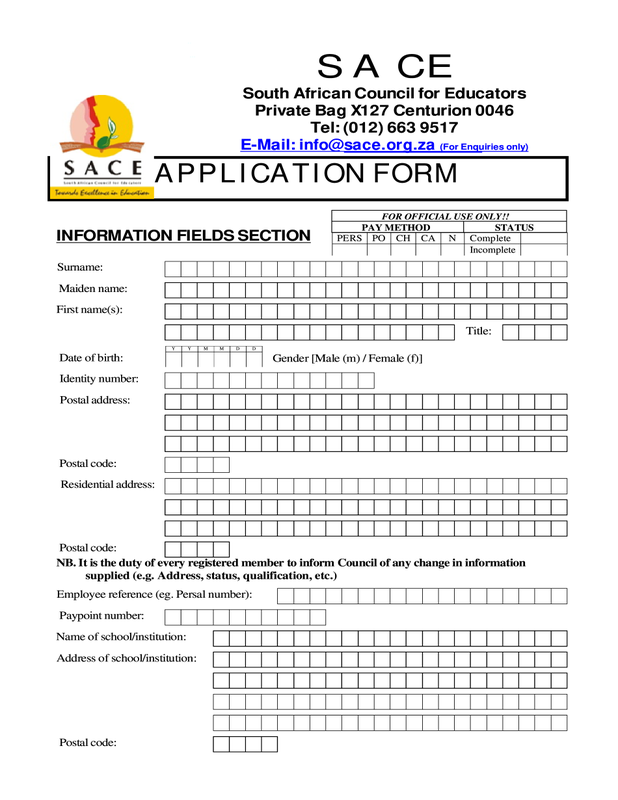 How to prepare the SACE application Form ? PDF template is editable, so you can make any changes to the document make it correspond your specific circumstances. In case, you are non-South African citizen, try to send your qualifications and academic transcripts to your provincial education department. © 2019 sace-application-form.com. All rights reserved.